Tiger Tales: A Detroit Tigers Blog: How Many Runs Will The Tigers Score In 2019? How Many Runs Will The Tigers Score In 2019? 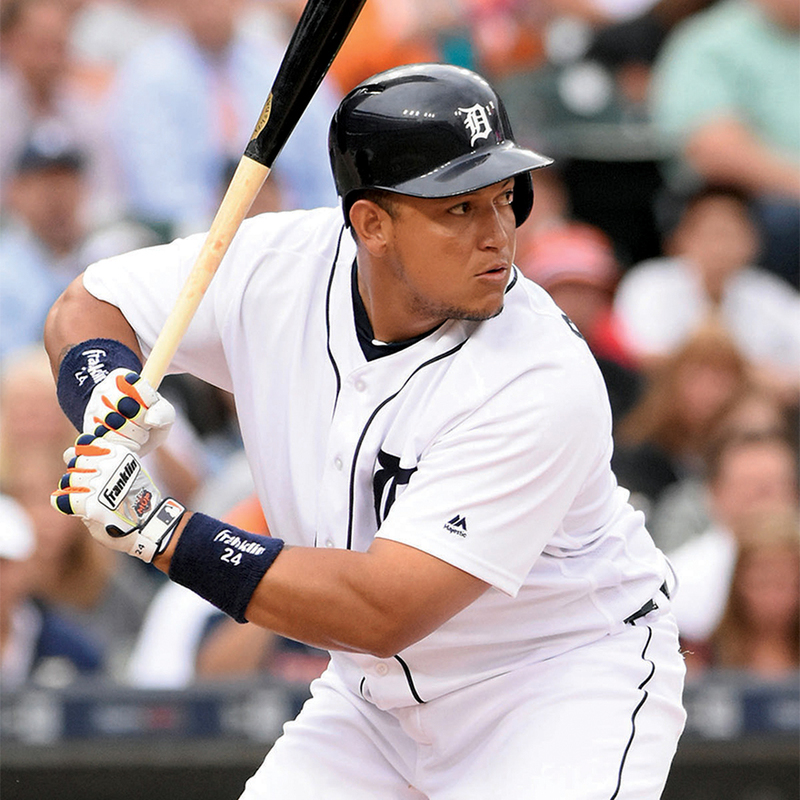 The health of first baseman Miguel Cabrera will be a big determinant in how many runs the Tigers score in 2019 (Photo source: Crain's Detroit Business). It is time for my annual runs scored prediction for the Tigers. Table 1 below shows that I had been pretty good (lucky?) at projecting the Tigers team run totals for a few years, but not so good last year. In 2013, I projected that they would score 800 runs and they actually scored 796, so I was off by just four runs. Moreover, I missed by just three and five runs respectively in 2014 and 2016. Thus, my forecasts came within 1% of the actual runs scored those three years. It gets more difficult when your legendary slugging first baseman has his season derailed by injuries and two of your best hitters are shipped elsewhere during an in-season fire sale. Given that, it is surprising, that I was off by only 15 (a two percent difference) in 2017. My formula did not work so well in 2015 when I predicted they would score 770 and they instead scored 689, a difference of 81 runs. Much of the discrepancy was accounted for by injuries to first baseman Miguel Cabrera and designated hitter Victor Martinez and the mid-season fire sale which sent outfielder Yoenis Cespedes to the Mets. In 2018, I predicted that the Tigers would score 685 runs, but they only scored 630, a difference of 55 runs. What went wrong was that I was too optimistic regarding Miguel Cabrera. I had him pegged for 600 plate appearances and a big comeback season. Instead, he missed most of the season with a ruptured biceps which limited him to just 157 plate appearances. The Weighted Runs Created (wRC) statistic at FanGraphs is useful for this kind of exercise because a team's Runs Created total usually falls fairly close to its run scored total. Most teams have Runs Created within 5% of their runs scored. The Tigers combined for 609 Runs Created in 2018 which was 21 (or 3%) fewer than their actual runs scored. One reason why the Tigers scored more runs than they created last year is that Runs Created does not account for runs gained from base running. The Tigers gained 6 runs due to base running (According to FanGraphs baserunning runs statistic). It also may have helped that they hit for a higher OPS with runners on base than with the bases empty (.731 versus .643). Keeping the above caveats in mind, the Runs Created measure is generally helpful in projecting future offensive production. Table 2 below lists the Tigers most likely regulars in 2019 and their estimated plate appearances (PA). In the next column is the three-year average of Runs Created adjusted for expected PA. For example, Cabrera had 210 Runs Created in 1,365 plate appearances over 2016-2018 which comes out to .154 Runs Created Per PA. Multiplying .154 times 500 PA (his projected PA for 2019) yields an adjusted three-year average of 77 Runs Created. The final column of the table is my forecast for Runs Created in 2019. In all cases, it is fairly close to the three-year average, but I make adjustments if I think a player will improve or regress this year. I don't have a formula for doing that. It is just a judgement call based on what I know about things that an average of past seasons might not take into account such as advancing age or a change in a player's health. In Cabrera's case, I am projecting that he will be right on his three-year average. I would normally knock a 36-year-old player down a few notches, but his poor health brought down his performance the last two years. Perhaps, I am being too optimistic again assuming better health this year, but so far he seems to be in good shape. On the other hand, I expect that the keystone combination of Josh Harrison and Jordy Mercer will both regress a bit with age. How Many Runs Will The Tigers Allow in 2019?